The UK's Orange Goblin further cement their status as elder statesmen of all things heavy. It's hard to believe that Orange Goblin was formed all the way back in 1995. Without doubt, the band is cemented as Doom/Stoner royalty and are at a point now where they write songs they want to play regardless of genre demands. This is a band that has played together for so long they simply gel in a way few others do. They perform as one unit rather than as the sum of their parts which is a secret to their refined delivery. Released just days ago, 'The Wolf Bites Back' is an excellent offering of music to decorate one's summer outings and also a fitting reminder that despite the fact that four years have passed since their last release, Orange Goblin are still around creating and performing loud and raucous tunes made for hell-raising and beer-chugging. Beginning with a roll on the toms reminiscent of Iron Maiden's 'Where Eagles Dare', the first track, 'Sons of Salem', serves as the perfect lead track as it has an undeniable momentum that one cannot help but get lost in. This is finely crafted Metal. Period. The next track, which bears the album's title, is built on a sturdy, catchy riff that evokes classic NWOBHM along with some quintessential Motörhead vibes. This is a truly slamming song that exudes pure Rock fury and is truly worthy of the honor of title track. The fourth track, 'Swords of Fire', begins with a grooving bass line soaked in distortion, syncopated, and effectively serving as the driving force for the song. When the guitar comes in, it is first clean, allowing the bass to still maintain its hypnotic effect, but soon the two instruments converge with their respective heavy forms. The frantic part in the latter half of the song is simply pummeling showing off an advanced rhythm spearheaded by aggro-bass that has hints of that classic Godflesh driving bass sound. 'Suicide Division', the seventh track, is pile-driving, furious, and militant. The song reminds one of Venom playing late 1980s Crossover with the brutality of the music over seen by ferociously delivered vocals. The last track, 'Zeitgeist', has its own distinct vibe as it is held together by some very Thin Lizzy-like guitar harmonies. Overall, though, the track has a quite eerie feel with huge open chords over shuffling drums intimating a type of quest. Some of the best lead work on the album appears here delivered purely via a cranked amp and a trusty wah-pedal. While not as mind-blowing as 'A Eulogy for the Damned', 'The Wolf Bites Back' has a much more solid production and mature delivery while still harkening back to that album at times with its intensity. While this may not necessarily be a Doom record as such, all are aware of Orange Goblin's Kyuss-like origins, and it is without doubt that not only has their success helped the scene over the years, but now, in 2018, they have a brighter chance to shine a light on many underground bands slaving away to be heard. 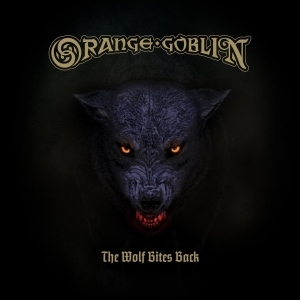 Orange Goblin have paid their dues and 'The Wolf Bites Back' solidifies them as elder statesmen of all things heavy. Rock 'N Roll truly gets better with age as this album testifies for the band has had time to experiment, perform, noodle, and compose over the years to finely tune their craft. As the old guard such as bands like Black Sabbath, Motörhead, and now, Slayer, are going away, the torch must be passed on to new lifers to keep the fires burning. With this type of momentum going for them, Orange Goblin should be melting faces for many, many years to come. Visit the Orange Goblin bandpage.